Early morning Aug 5, while the majority of her peers slumbered, CHS senior Simone Bernstein prepared to share her summer project with Randi Naughton of FOX 2 news. After contacting numerous organizations to gain media coverage for her newly created website, www.stlouisvolunteen.com, her search was rewarded with a three-minute live interview on FOX 2 News. Bernsteinâ€™s interview was helpful in promoting the site, a welcome reward after her extensive search for publicity. 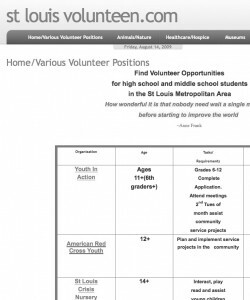 St. Louis Volunteen informs youth up to age 18 about volunteer opportunities in the St. Louis metropolitan area. The site provides links, descriptions, age ranges, and contact information for various organizations such as the St. Louis Science Center and Humane Society. Creating a website from scratch is a daunting task, even for the technology-savvy. For Bernstein, the creation of stlouisvolunteen.com required heavy reliance on on-line technical support. But the learning process was not without the occasional mishap. Using her own funds, Bernstein purchased the domain name and a year of web hosting. She welcomes aid in the creation and keeping of the site. â€œI am hoping some kind soul steps up and volunteers their technical skills and website design expertise,â€ Bernstein said. Bernsteinâ€™s motivation for constructing the website stem from her own experiences with volunteering. Because many volunteer positions are restricted to adults, Bernsteinâ€™s website focuses on a specific age group. Many St. Louis area high schools require community service hours, thus heightening the demand for volunteer work for teens. â€œMy goal is to promote opportunities for youth volunteers in our community, encouraging both students to get involved and non-profit organizations to create and develop volunteer training programs for teens,â€ Bernstein said. Leading by example, Bernstein volunteers for several of the organizations found on her website. Satisfied with her personal volunteering experiences, Bernstein recommends other youth to find equally rewarding volunteer work. With the economy in such a poor state, volunteer work may provide work experience for youth unable to find employment.